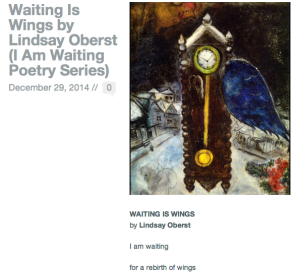 I’m thankful Silver Birch Press decided to feature my poem, “Waiting Is Wings,” on their blog, as part of their “I am Waiting” series. See the full poem and my notes about the poem on the Silver Birch Press blog. I enjoyed reading many poems featured in this series and am excited to be among them. Read my poem and then check out some of the others, too. If the press gets enough submissions — submissions are now closed — they’ll publish a book of found poems and poems about waiting inspired by Ferlinghetti’s original. Note: The image above the poem is “Clock with Blue Wing” by Marc Chagall (1949).